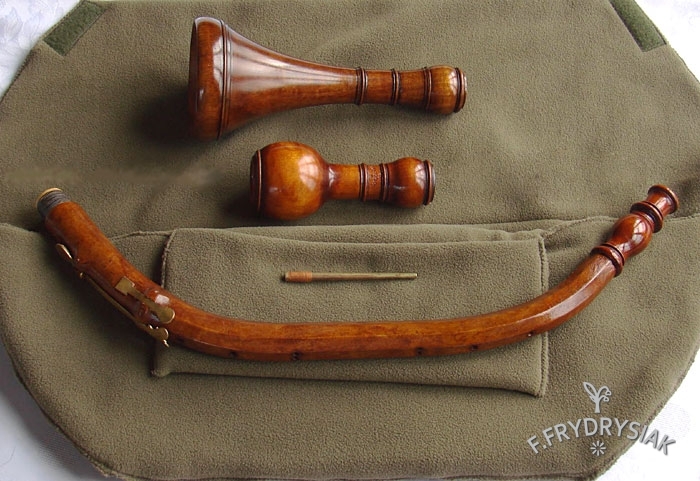 This set includes one curved body and two Bells: one big flaring „da caccia” and a smaller , bulbous “English horn” one. This unusual set of two instruments with additional, exchangeable da caccia bell, fitting both instruments first time I had in my hands in the Autumn of 2010, and then in January of 2011 I measured them and renovated them. These originals are in possession of Weaving Museum in Kamienna Góra, Poland. Unfortunately, in 2015, other “conservation” of these instruments was carried out by complete dilettants, as a result of which they lost many of their musical qualities, they were also “painted” (sic!). I am only the one, who make copies after Weigel’s cor anglais and oboe da caccia from Kamienna Góra. All prerequisites indicate that Weigel was inventor of this kind of oboe. The oldest scores known today, mentioning cor anglais by it’s correct name, come from places located not far from Wrocław (Breslau). The term „cor anglais” ( English horn) in respect of so early instruments as these copies, should be rather substituted by term „angelic horn” , which name they most probably originally had. At that time German word ”englisch” had another, today forgotten meaning „angelic”. Thus, the original name was even not distorted but it’s primary meaning, being no longer in use , was just forgotten and lost in translations.The fact of giving these instruments such a name is not surpising, because their sound is extremely soft, silky and melodious. Considering the impression it must have made on listeners inside a church , where probably was most often used, this association is completely understandable. Besides, baroque oboes, including cor anglais used to play together with horns , named in German „Wald horns „ or briefly „ horns”. If we consider how a French horn player holds his instrument and and how the ancient oboist had to play his curved instrument, we can see that both instruments might have had a similar look, especially from a distance. 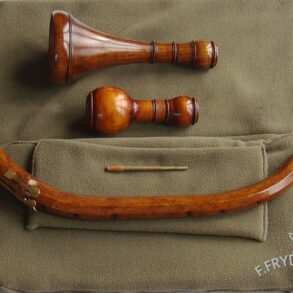 The first was called „wald horn”, so the other one, sounding softer , was called „angelic horn” (englisch horn). Originals plays at a’= 415 Hz and made from stained sycamore wood, brown leather covered.